The users of both Yelp and Chowhound were in agreement that 26 Beach made a damn fine cheeseburger. To top that, 26 Beach's staffers all wore shirts emblazoned with "The Best Burger in L.A." They even posted that on their special board--no specials--just THE BEST BURGER IN L.A. 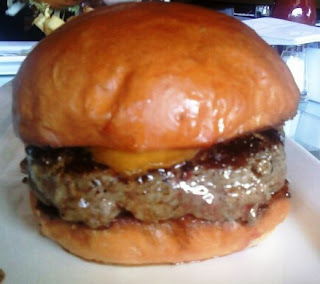 The menus boasted this: "Famous Craftsman Hamburgers on housemade buns. No chef has been making Craftsman Burgers longer!" I couldn't figure out what that meant, but it sounded fantastic. Ready...Set...Terrible! The Beef: The burger patty was Angus Chuck It had been pre-ground somewhere far away. This was an 80:20 blend, which was more like 75:25. 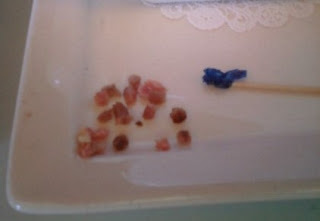 Then again, mine had so much cartilage in it that it could have accounted for 5% of the mass. I discovered that "best" and "Craftsman" were code for "oily" and "full of gristle." After eating half of this thing, I gave up and sent it back. There was gristle in every single bite. In fairness they did take my food off of the bill. The beef tasted wet-aged, and it had almost no character in terms of flavor or texture. The coarsely ground, bland chuck was doughy and neutral. The Sear: The grilled sear was competent and relatively thorough. WIN. 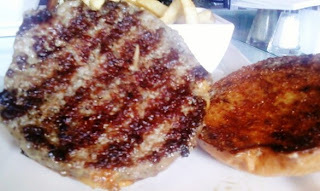 The Seasoning: The burger patty was little salty on the outside, but it was bland, bland, bland on the inside. The Preparation: I requested Med-Rare, but I received Med-Rare...heavy on the Rare. This did not work with the insipid, soft, oily beef. It was odd, because the burger patty's cooked layer accounted for 1/3 of the depth, but the meat was still dead raw in the center. The Cheese: This was a relatively bland Cheddar--it added no tang or saltiness to the dish. The Bun: The bun at 26 Beach was a competently toasted but very, egg-heavy brioche. It was much too chewy. The chewiness of the egg and the sweetness from the bun completely overwhelmed the bland, loose, greasy beef. Meat To Bun Ratio: It seemed close, but the bun was a complete mismatch to the beef, so there really was not a good way to judge this factor. The Fries: The fries were competently cooked, but they were not seasoned. Bland. For a price of $13, this was a very poor burger value--it was inedible. Best Burger in LA...really? Most Gristle-Filled Burger in LA would have at least been truthful. It was a great way to stay in shape, though. Gnawing on gristle burned calories, and I sent most of it back. Maybe they should have marketed this ghastly thing as a diet burger. Again, they did comp the burger after the manager was shown the impressive gristle collection that I amassed from only 50% of my burger patty. Burger Review : The cheeseburger at 26 Beach looked great and was competently prepared, but each of the components fell completely flat. Based upon this visit and the quality of the ingredients, I would not return. Stick with Tommy's -- you obviously have zero taste in burgers. We are pleased to celebrate your wrongness on this front. Big Tomy's was, at least, edible. The burger at 26 Beach was so bad that it was returned and comped. I eat there all the time and I have never experienced this. I hope you give them another try. That was a lot of gristle. Your comment about beef to bun is misleading, in my mind, in that you had nothing on the burger besides meat and cheese. All their burgers come with lettuce, tomato and onion. If you went to Bob's Big Boy and got just meat and cheese their meat to bun ratio would be off. I went to The Counter 4 times before I had a good experience, and then it was not the original location, it was the franchise in Studio City! Enjoy life, eat more burgers! Way to mention that in your original review. I guess we can add dishonest to your description, too. Editor's Note: This comment was mistakenly deleted. "In fairness they did take my food off of the bill." This verbiage is part of the original review, and can be seen in the second paragraph.